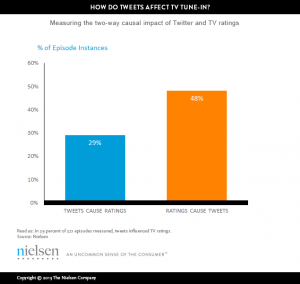 In another bandwidth-deficient edition of The Baer Facts, I talk with Kyle Lacy of ExactTarget about new research from Nielsen that shows tweets causing actual increases in television ratings. I’ve been a skeptic of the relationship between Twitter chatter and TV ratings for a long time. To me, the people tweeting about a show are already watching the show, so the Twitter-fueled “back channel” surrounding the show may result in additional loyalty and/or visits to the show’s website/Facebook page/SnapChat account etc., but won’t generate net new viewers. But for the first time, there’s evidence that proves me wrong (sometimes). Comprehensive new research from Nielsen found that in 29% of the cases, Twitter chatter actually caused increased viewership. Not just a correlation, a causation. Now, before you run out and find a way to create a VERY special episode of “Honey Jebediah, the Amish mafia duck call impresario” that will get a TON of tweets, realize that it’s only 29%. For 71% of all television programs, more tweets didn’t equal more eyeballs on the TV show. However (and perhaps not surprisingly), the category of television where tweets are most likely to increase viewership (44% of the time) is for competitive reality programs like The Voice, Top Chef, Project Runway, and the like. Nielsen found that this effect works both ways. Tweets cause viewership 29% of the time, and viewership causes Twitter chatter nearly half the time (48%). I suspect the latter figure would be much higher, but there are still many popular television programs whose viewers are far less likely to be Twitter users, demographically. This seems like very good news for Twitter’s advertising department, especially as they lurch onward toward an IPO. Does this data from Nielsen change how you think about social TV? It certainly got my attention.